Where Was My Y-DNA and mtDNA in 1808? A few days ago I wrote about John Reid’s “Where Has Your DNA Been” post at Anglo-Connections a few days ago. This is similar to another meme which has been circulating the genealogy blogosphere for a few weeks now, including “Where was your family in 1908?” at 100 Years in America and “Where was your family 200 years ago?” at What’s Past is Prologue. Steve at Steve’s Genealogy Blog has also given the ‘Map Your DNA’ meme a try. I thought it was a fun idea, and had a number of potentially interesting applications, if I were a programmer and if I had any free time. Absent that, I thought I would at least try to replicate John’s idea by mapping my location in 2008 versus the locations of my Y-DNA and mtDNA in 1808, 200 years ago. First, my Y-DNA. The blue dot on the following map of New York State is the location of my great-great-great-great-great-grandfather in 1808, and the yellow dot is me in 2008. The two dots are only 11 miles apart!! So, my Y-DNA has traveled at an average speed of just 0.05 miles per year! My Y-DNA appears to be a little lazy. Next, my mtDNA. The blue dot on the Cayman Islands is the location of my great-great-great-great-great-great-grandmother in 1808, and the yellow dot is me in 2008. The distance between the two locations is 1664 miles, for a average traveling speed of 8.3 miles per year! Now that’s more like it! Where was YOUR mtDNA and Y-DNA in 1808? Brooke – that’s quite a journey, halfway around the world! Thanks for stopping by and leaving a comment! 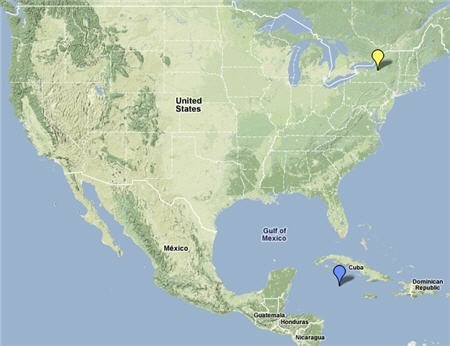 Pingback: Zalewski Family Genealogy » Blog Archive » Where was my Y-DNA and mtDNA in 1808? Scenario You are between the ages of 18 and 35 and live in a city, town or neighborhood where a homicide has occurred. A police officer comes to your home and requests a cheek swab of your saliva so that a DNA profile can be obtained. You are told that the purpose of obtaining your DNA is to exclude you as a suspect. This is what is known as a DNA dragnet to find the perpetrator of a crime. You are told that you have the right to refuse but if you do, the police will treat you as a potential suspect. You are not told anything about what will happen to your DNA profile and the biological sample from which it is drawn after the case is closed. My Y-DNA was in County Leitrim, Ireland and my mt-DNA was in Valledolmo, Sicily, Italy.